Joyous expressions, haunting visions and political defiance- such are the components of the season’s most exciting region-wide art project, Pacific Standard Time: LA/LA, an initiative of the Getty Center with support from Bank of America. This immense amalgam of Latino art, ranging from Latin American to Chicano to Afro-Latino, is of late installed in the form of 70-plus exhibitions across Southern California. The massive survey will run from September until January 2018. 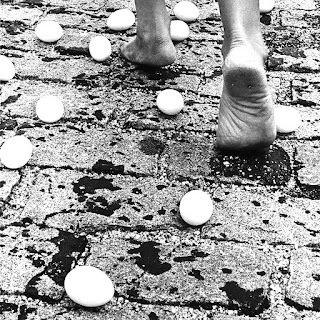 The exhibit at MOCA focuses on Brazilian artist Anna Maria Maiolino, an artist of visceral power whose work covers photography, sculpture and painting. Curated by Bryan Barcena and Helen Molesworth , the exhibit of Maiolino’s work is deeply psychological in its changeling spirit. Clay sculptures of contorted knots and strands resemble chains, while framed pieces display a screaming, blue figure with exposed intestines- a kind of gore reminiscent of the visions of Mexican surrealist Leonora Carrington. Maiolino’s work is a window into the era of the U.S.-backed military dictatorship in Brazil. After the 1964 coup against Jao Goulart, bonfires soon consumed books and torture chambers filled with dissidents. Maiolino’s work captures this history in pieces ranging from a painting of a skull in military uniform, to a photo montage where a woman takes scissors to her tongue and nose. 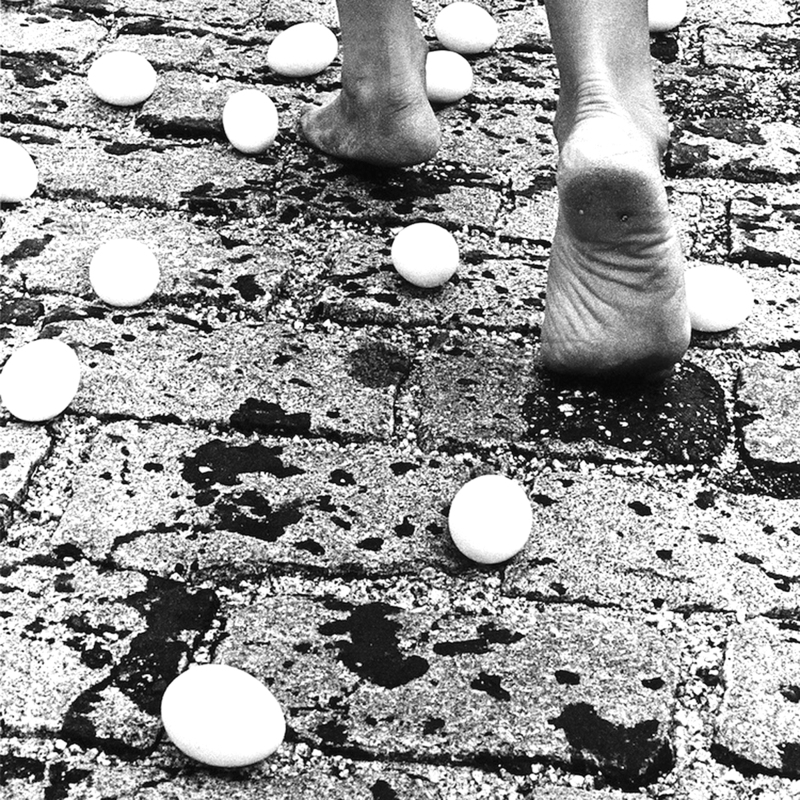 In another series of black and white photos, elegant bare feet walk in-between eggs. The crushing shadow of fascism is evident in these works with a timeless, eerie familiarity when torchlight marches now take place even in the land of Manifest Destiny. Visitors to this exhibit would do well to go home and read about the recent 2009 U.S.-backed coup in Honduras. One wonders what artists have now fled across the border in a tragic replay of this old imperial waltz. Darwing by tragic artist Martín Ramirez at the Institute of Contemporary Art in DTLA. There was a noticeable silence among the press group as we gazed at work put together from toilet paper, glue, paint, unused office paper, and anything else Ramírez could use in the closed world of an asylum. The pieces evoked images of Mexican militiamen on horseback, luminous Madonnas and endless, dark tunnels with passing trains (Ramírez made his way to California on trains, and the images surely form part of his inner voice). In one chilling piece, a figure with a rictus smile lies on a bed in a small room reminiscent of a cell or mental ward. Ramírez’s work is the migrant experience stripped of romance or sentimentalism, it is the horror of being uprooted and displaced. . “Much of this story is full of chapters that are so sad,” said Longhauser while leading a tour of the exhibit. Ramírez’s work gains a haunted relevance as the immigrant experience and displacement become prominent concerns in the age of Trump- it is a look back at a time when immigrants were casually thrown into asylums over language barriers, and today they are still rounded up and thrown into darkened places. At Self Help Graphics and Art—a venterable east side community cultural center and art space founded in 1972 (yes, half a century! )—the origin and undeniably rich source of L.A.’s vibrant, contemporary Day of the Dead celebration comes to life in Dia De Los Muertos: A Cultural Legacy, Past, Present & Future. The shuttle ride crossing over from the suburban confines of the west side into the gentrified badlands of the east was interesting as local and foreign journalists peered in awe at local murals and into the fierce eyes of indigenous revolutionary Mexican General Emiliano Zapata. If MOCA captures the art forged in South American politics of the 1960s and the provocative Ramírez exhibition at ICA LA frames an unfortunately all too common manifestation of the migrant experience, then Self Help’s gallery is a beautiful snapshot of cultural ritual and Chicano life. The exhibit is co-curated by Self Help Graphics legacy artist Linda Vallejo and Dr. Betty Brown. A lively show, the Self Help exhibit features gorgeous vintage art from the 1970s and earlier, celebrating Day of the Dead in all its baroque pageantry. A life-size skeleton dazzles in a zoot suit while posters from 1977 and beyond show the range of artwork shifting from psychedelic to graffiti, that has defined the Day of the Dead for generations. 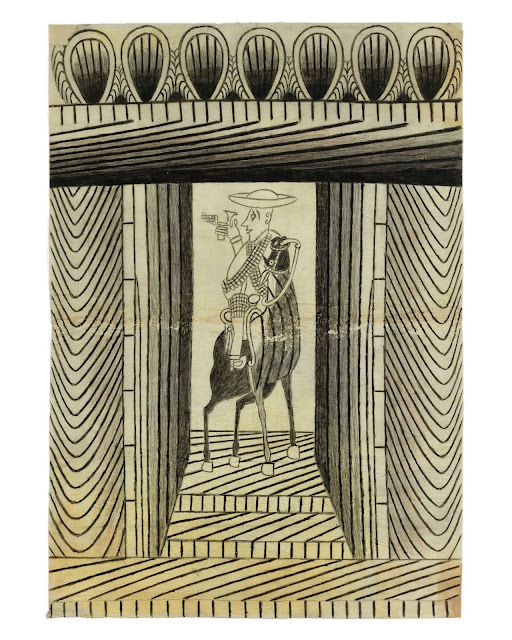 It is also in this exhibit where those unfamiliar with L.A. Chicano culture get a glimpse into the bridging of borders and societies that defines the local Latino experience. One of the curiosities of Los Angeles is how such a metropolis can find itself so atomized socially. Pacific Standard Time breaks that isolation by sharing artistic visions from the Latin side of the hemisphere with the city’s farthest reaches. The museums participating in the program have catalogues replete with information on the many sites featuring themed exhibitions. Ironically, just as gentrification becomes an urgent issue, even the so-called “hipsters” a substantial quotient of native community stakeholders facing displacement rail against will now gaze at the works of persecuted Marxists and gender-defying radicals at exhibits such as Radical Women: Latin American Art, 1960-1985 at glitzy Westwood’s Hammer Museum, or Golden Kingdoms, an overview of pre-Columbian cultures at the Getty Center. This, of course, is for the better, because it is art opening a window or placing the predictable observer or museum-goer in some one else’s shoes, a vantage point dissimilar to their own. If La La Land is defined by Hollywood, then PST showcases the long histories that define many of the neighborhoods and inhabitants of a city christened los angeles. They are communities which have been largely invisible until now, but no less significant than those which have traditionally been associated with the City of Angels, underscoring how long overdue this historic survey attractively packaged by the Getty and Pacific Standard Time truly is.